Yesterday, along with my girlfriend, I rode just over 100k on a training ride. My previous long ride was about 75k, so I extended that by 25. It felt like an accomplishment, I am pretty proud of that mileage. We left Merville and took the Old Island Highway into Willow Point, then took Dogwood Ave into Merecroft Village. The head wind was quite strong, especially along the ocean. It was a beautiful day. It was supposed to rain this weekend, but the Good Mother was nice to us, and brought the sun. It was about 45k to Merecroft Village, where we got take out food from Baba Gannouj. I had never eaten much Middle Eastern food, and I was pleasantly surprised. I had tried falafel before, and I really enjoyed theirs. I had a Donair and a falafel sandwich. The Donair was wrapped in there house made flat bread, and the falafel sandwich was wrapped in a pita, and stuffed with lettuce, tomato, cucumber, pickles and secret sauce that reminded me of tzatziki. It was all really tasty, and I will go back for sure. My girlfriend had the vegetarian platter, which had three different salads, three sauces and a big pile of falafel. I had to help her out with that after I finished my two wraps. I was stuffed, I probably didn't need the liter of chocolate milk. I love to eat and cycling allows me to put it down without feeling guilty, I need the calories. We had a nice stop for lunch at some hidden picnic tables, in the hot sun, with a great view of the mountains. We took a back way out to the Campbell River bypass and after a quick stop at the Shell station, we hit the Inland Island Highway, for the trip back to Cumberland. The ride was at a mellow pace, we never raced and didn't have to sweat too much. It was what I can assume will be more of a touring pace. I carried two panniers yesterday, so I had some weight on. It was nothing like I will be carrying on our tour, it was good to have some extra weight. By the time we were getting close to Cumberland, after about 80k, my hands were getting really sore. I don't know what I could do to make it better, I believe that is just going to happen unless I change my handle bars. Maybe after consecutive days it won't be so bad. I was getting frustrated of the motorists on the Inland Highway. The road between Campbell River and Cumberland isn't very busy, especially on weekend afternoons. I would suggest that motorist on that road who see cyclist, please move over into the left hand lane when passing us two wheelers. Of course only when it is safe. It would make us really happy, and those who are considerate, I commend you. Good Karma to you all. 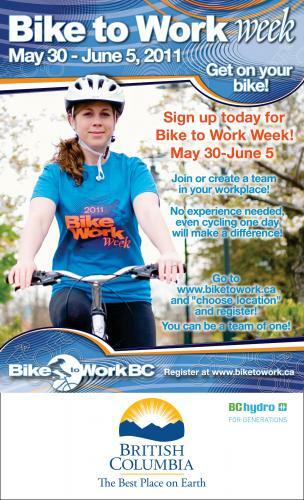 Bike to Work week is starting tomorrow. I hope many of my readers are getting out at least a couple of days this week coming up. I haven't checked the weather forecast for this week, hopefully it will be good for one and all. Enjoy it.